Summer is a fantastic time to support learning. Often, it occurs in informal settings like summer camp or family vacations. These opportunities can be structured or unstructured. They may not always be unique but afford greater flexibility than school classes. In 4-H, we are uniquely positioned to offer these rich learning opportunities across contexts and topics. I have written before about the importance of building science and failure into youth learning, referencing a project, Driven to Discover: Enabling student inquiry through citizen science (D2D), in which I worked with a group of Extension faculty to develop a program model with two important attributes for using citizen science as a setting for STEM education. Through D2D we learned that meaningful STEM informal learning programs for youth involve balancing scientific authenticity and positive youth engagement. These two dimensions form a starting point for program design that prompt two questions to guide design of the experience: is the focus creating a positive youth engagement program that has scientific authentic experience or is the focus scientific authentic experience that creates positive youth engagement? Using this citizen-science approach, this summer I worked with colleagues in Lake County, Minnesota to design a six-week summer program focused on aquatic invasive species. It’s called Water Watchers: Becoming an Aquatic Scientist. 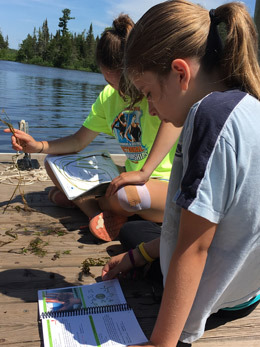 Partnering with the county’s 4-H program coordinator and the local Soil and Water Conservation District’s aquatic invasive species coordinator, we set a goal to explore strategies to authentically engage youth in the scientific processes that would attract them to join local stewardship activities. We built in recreation opportunities like fishing, canoeing and kayaking. We emphasized team building to strengthen group dynamics. Perhaps most important was working with professionals in the community and youth to share observations and identify species in research efforts that were already underway. The results provided meaningful and authentic contributions to citizen science and helped youth developing science identities. How do you think working with scientists to engage youth in scientific research is different than creating youth programs that develop scientific processes? How do you connect with scientists to work with youth to do citizen science? To clarify, one of the things that made this program unique is that we focused on involving youth in an authentic environmental monitoring project, the adult leaders were trained in University of Minnesota Extension AIS Detectors. The youth collected data as part of this program, and even recorded some first detections along with developing their own scientific research posters. With a few exceptions, such as the Driven to Discover project you mention, most citizen science projects do not focus on the scientific process or the relevance of an individual's participation (this is my opinion and may be my alternative fact!). However there are references in citizen science literature that describe different types of citizen science projects, one of which seems to lend itself well to youth engagement, “Community Science.” Community science projects are ones where the public has an interest in an issue and reach out to scientists to help them study and understand the issue. Projects such as these are often initiated with the goal to effect change. The possibility of effecting authentic change in their community is an enticing motivator for youth to learn about the scientific process. So, as an educator in a time of alternative facts, I hope citizen science projects are created with as much emphasis on teaching participants the whole scientific process as there is on data collection. Very interesting addition to the conversation, Margo. Thanks for sharing that article and describing community science as another alternative with important educational and CHANGE results.